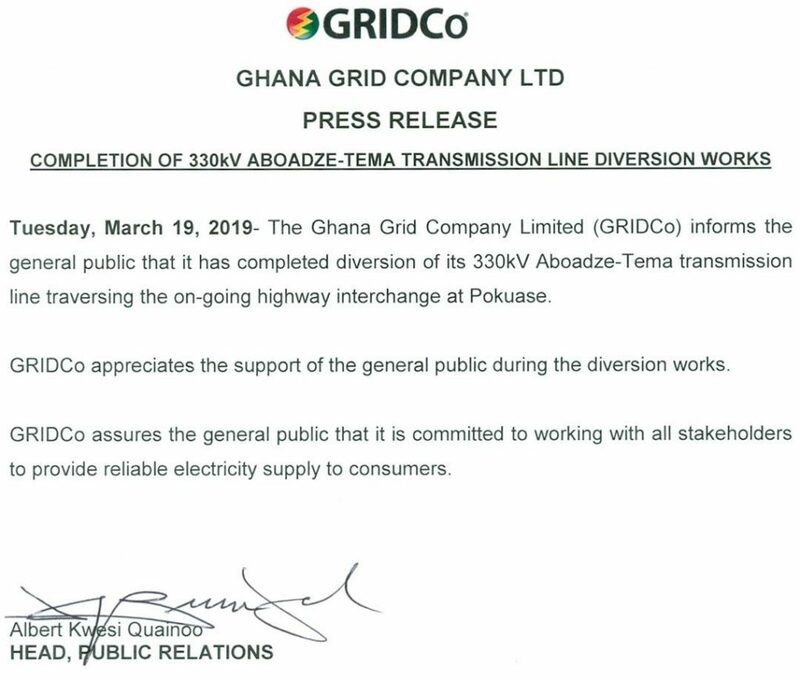 GHANA GRID Company Limited (GRIDCo) says it has completed diversion of its 330kv Aboadze-Tema transmission line traversing the on-going highway interchange at Pokuase in Accra. This was contained in a statement issued and signed by GRIDCo’s Head of Public Relation, Albert Kwesi Quainoo on Tuesday. “GRIDCo appreciate support of the general public during the diversion works,” the statement said. Last week, the Power Distribution Service (PDS) was advised to shed load at various Bulk Supply Points to ensure system stability in Ghana’s power distribution. A request by GRIDCo was due to the construction of the road interchange at the ACP Junction, Pokuase, because the capacity of the transmission network will be limited. The move is to allow the contractor to complete work on the power line. Parts of the country since last week witnessed power outages. The outages have occurred in many parts of the capital, Accra, Cape Coast, Sekondi-Takoradi, Kumasi, Volta Region and some parts of the country. The completion of the diversion transmission line is expected to ease recent power outages being experience in some parts of the country.